We’ve successfully stepped up onto the first rung of our ladder to Tevis 2014. We completed the American River 50 on Saturday, April 26th. American River is a point-to-point ride along Folsom Lake and (shockingly) the American River. Slightly more complicated than most endurance rides because you have to get your rig moved to the end point, but really challenging terrain and very beautiful. Because the trail is not conducive to passing in the early going – it’s mostly single-track – we made a point of starting out farther to the front than we typically do. 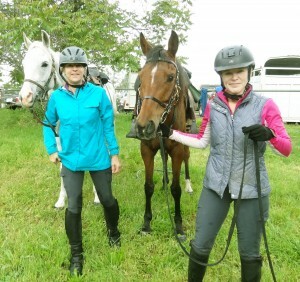 We were caught up in the midst a fast-moving group of about eight horses – switching leads every once in a while – into the first vet check at about 17 miles. Only one of those horses left the vet check in front of us and we caught him up fairly quickly.